First up, we have a trailer for Food Fight, one of the Skylanders that is included in the Skylanders Trap Team starter pack. 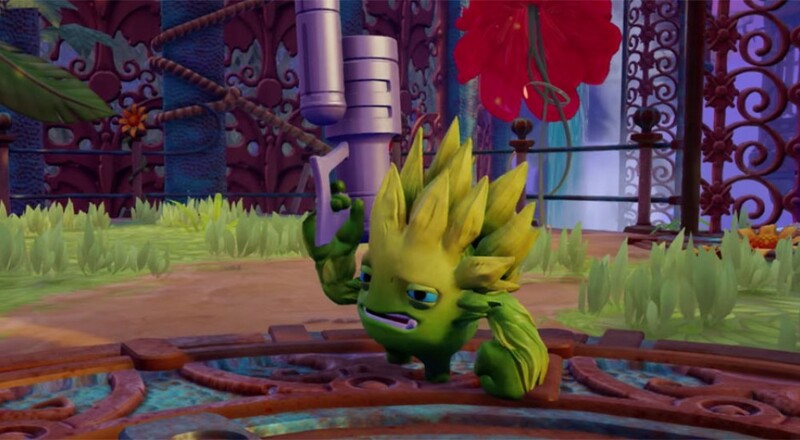 He's a living artichoke that shoots vegetables out of a gun. Terrifying? Awesome? Terrifyingly awesome? It's your call! Then we have trailers for three characters that will be sold separately from the starter pack, all of which were also part of a contest. The contest resulted in all three of these characters being named by fans, as well as having their backstories written by fans. These trailers also show off a little bit of the new trap mechanic, where players can trap bad guys and bring them out for skills. We have High Five, a dragonfly racer - as in, a dragonfly that competes in races. Then, we have Bat Spin, a vampire who can turn into a bat... and spin... Well, the name is descriptive! Last up, we have Flip Wreck, a Dolphin has cobbled together parts of sunken ships to form his armor and weaponry. Flip Wreck, get it? 'Cause shipwreck? Are you guys excited about the newest Skylanders game? What do you think of the contest skylanders? Skylanders Trap Team will be out on October 5th for (deep breath) Xbox 360, Xbox One, Playstation 3, Playstation 4, the Wii, the WiiU, iOS devices, Fire OS devices, and Android OS devices. It will support 2-player local co-op. Page created in 0.4180 seconds.